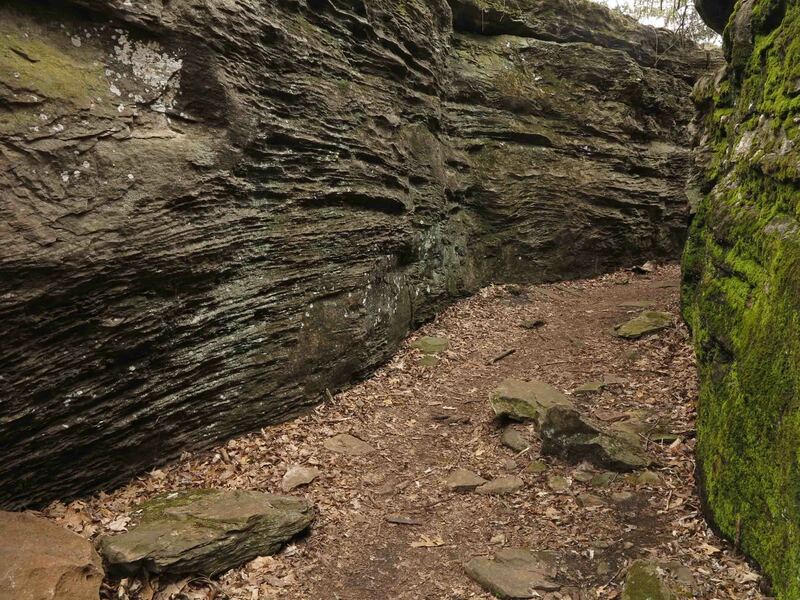 Having hiked part of the Rock City Trail once before, I didn’t anticipate how beautiful the rest of Mount Kessler would be! What I found was a treasure worthy of protection and sharing. There was delight in every step…even the muddy steps. I felt a sense of thankfulness as I walked. Thankful that this area is protected for me to enjoy. Thankful that Mount Kessler will be protected for future generations and thankful for the man who became the driving force behind this mountain. Frank Sharp, now retired, has dedicated his skills and energy to protecting Mount Kessler, establishing Mt Kessler Greenways for that purpose. The same talents and work ethic that helped him succeed in business have served Mt. Kessler well. He spent countless hours promoting the preservation of Mt. Kessler and surrounding areas, much of which is under private ownership. 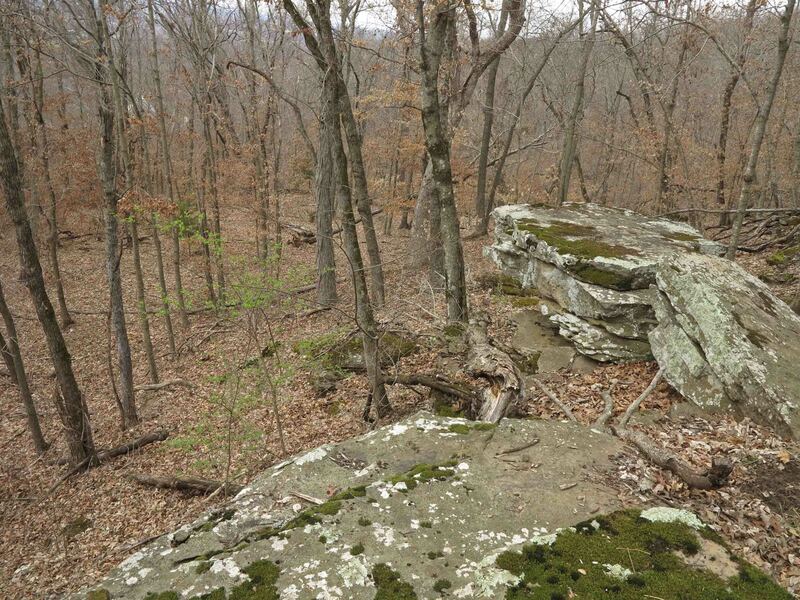 Mount Kessler Greenways now include about 1,500 acres, most of which is urban forest. Approximately 1,000 acres are inside the city limits of Fayetteville. His strategy has been to get people out on the trails of Mt. Kessler by foot or mountain bike. Once you’ve seen the area, you want to become part of the coalition to protect it. He built a massive coalition of thousands who wanted to see a protected mountain sitting at the edge of a burgeoning city. 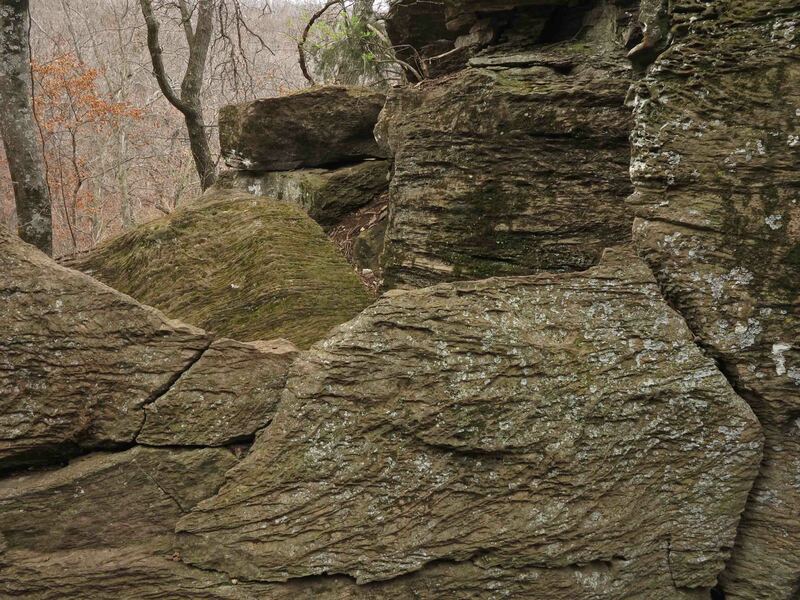 Hike the trails and see the results so far. 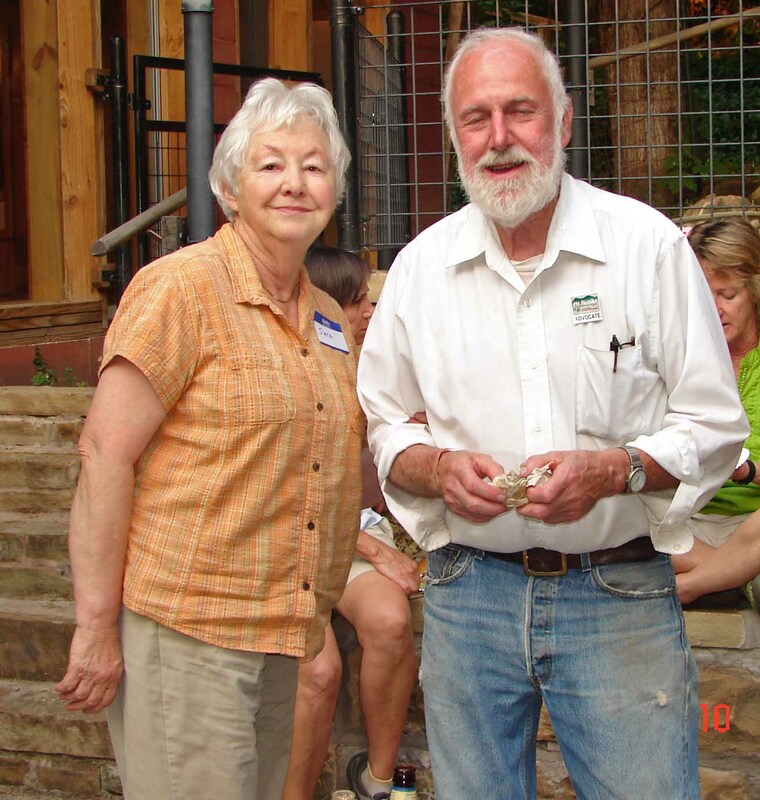 Frank Sharp, with his wife, sharing his vision of protecting Mount Kessler with the Ozark Highlands Trail Association. The trails do not have blaze markings but signs are posted at each intersection. 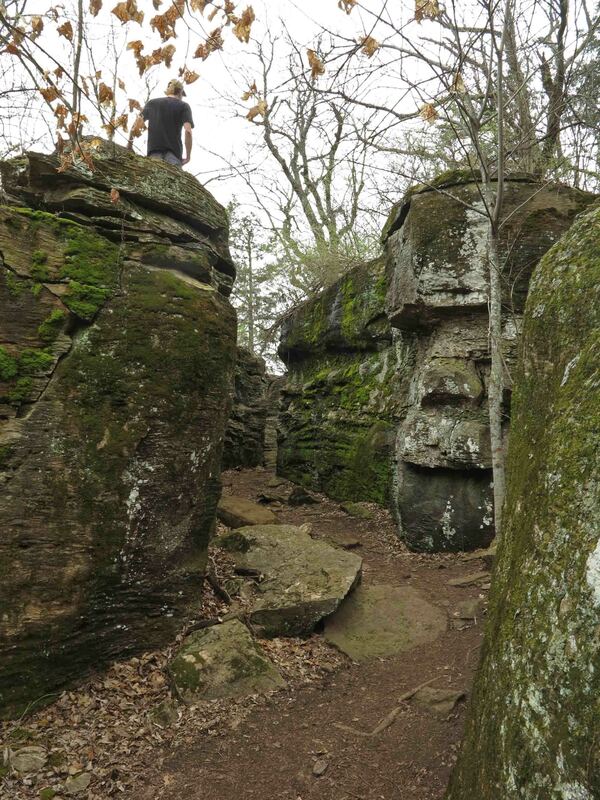 I hiked up the Serpentine Trail to access the Rock City Trail as an out-and-back. Then I did the Spellbound Trail before returning to the trailhead by way of the Trent Trail for a total distance of 9.2 miles. If hiking during a wet season, wear shoes you don’t mind getting muddy. I enjoyed walking through the mud but had a change of clothes so I could take my wife to Noodles Italian Kitchen for a wonderful post-hike meal. Signs are posted at every intersection. Getting There: From I-49 on the southern side of Fayetteville, take Exit 60 and drive south on Cato Springs Road for 0.6 mile. Watch for the Mount Kessler sign on the right. Turn right on Judge Cummins Rd. (Washington County 200). Drive 0.2 mile to the trailhead parking on the right. Be sure to sign in at the trail register next to the parking lot. Rock City with hiker exploring on top. 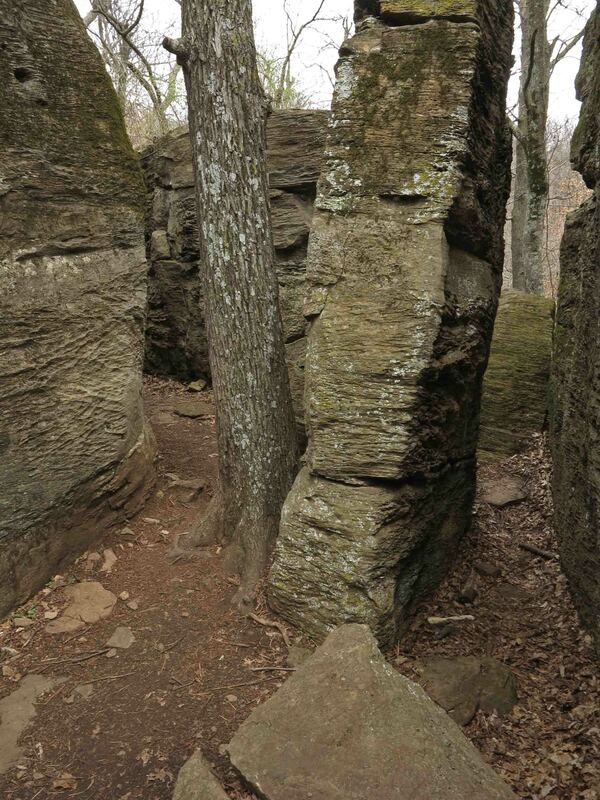 Rock formations next to the trail. Wide open hardwoods with an occasional glimpse of civilization down below. This entry was tagged Fayetteville Arkansas, Frank Sharp, Mount Kessler, Mt. Kessler, Mt. 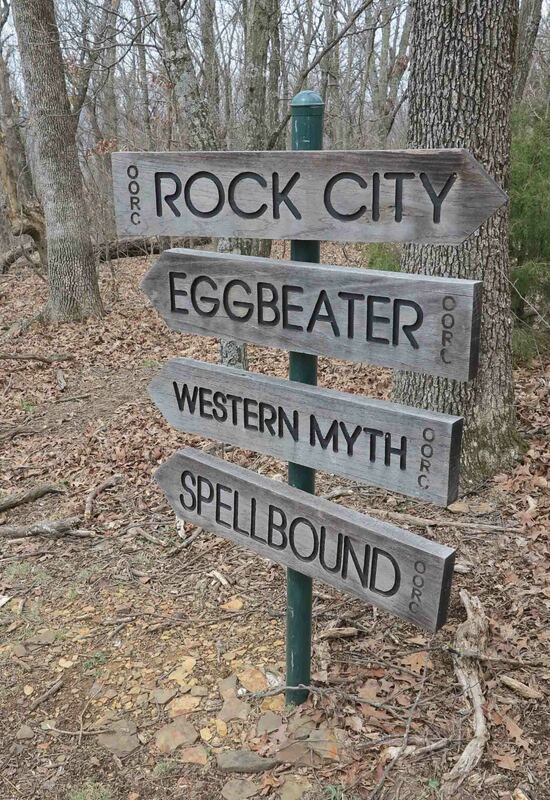 Kessler Greenways, Noodles Italian Kitchen, Ozark Smokehouse, Rock City Trail, Serpentine Trail, Spellbound Trail. Bookmark the permalink.